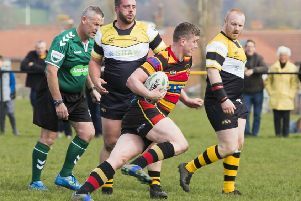 Heath finished their Yorkshire One programme in eighth place after a workmanlike 38-12 home win over a Yarnbury side who had clinched safety the previous week. Two high tackles from Yarnbury in the first minute gave Ezra Hinchliffe a shot at goal but his effort was just wide. The visitors responded and Howard Hanks and Cameron Ramsden were called on to make telling tackles. A clever kick from Jack Crabtree set up a Heath attack and it came as no surprise when Olly Cook received the ball out wide and he danced over the try line. Constant pressure from Heath led to a second unconverted try on 22 minutes, Hinchliffe pouncing as the ball bobbled from Sam Polllard’s kick. Heath were playing fast, open rugby and Yarnbury struggled to cope. Dom Walsh made a dash and released Peter Birkett but his pass to Si Brown was judged forward when a try looked certain. Josh White was controlling Heath’s scrums and Walsh made a superb clearance. The visitors were working hard to get on the score sheet but a wayward pass led to Cameron Ramsden hacking the ball forward. He scooped it up and sent Hanks in for Heath’s third try and a lead of 17-0 after 35 minutes. The second half began strongly for Heath as Ramsden went on a surging run and Crabtree evaded several tackles before releasing Hinchliffe, who ran in the bonus point try. The goal took Heath into a 24-0 lead after 52 minutes. The onslaught continued. Matt Beasty set up Ian Downsborough on a charge and Hanks went in for his second try with the conversion added. Yarnbury replied with an unconverted try on 65 minutes. Beasty’s determined run belatedly earned him a first score of the season but the visitors had the final word with a converted effort on 78 minutes.